SRA Home Products has installed durable screen rooms at homes throughout the Hockessin, Delaware, area since 1988. Our factory-trained and -certified installers have completed more than 5,500 installation projects using only the highest level of craftsmanship, which has helped us earn an A+ rating with the Better Business Bureau and a reputation as a trusted provider of stylish and functional outdoor living products. No matter which of these screen rooms you choose to have installed on your home, you can feel good knowing you and your family will remain protected from outdoor nuisances while enjoying the living space around your home. For example, the screen enclosures we install feature lightweight, removable vinyl sashes, which block up to 99 percent of the sun’s UV rays, so you can rest assured that your family and your furniture will be protected from the sun. 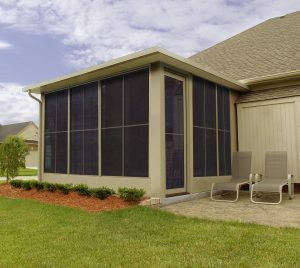 Our screen enclosures also offer protection from the scorching summer temperatures, thanks to their heat-deflecting solid thermal roofs, so you will be able to relax in a more comfortable outdoor environment even during the hottest summer months. Best of all, our screen rooms are protected by the manufacturer’s limited lifetime transferrable warranty, so you can feel good knowing that your investment will remain protected for years to come. Contact SRA Home Products today to learn more about the benefits of having a durable screen room installed at your home in the Hockessin, DE, area.